If you’re in the market for a good neck knife, there are several different considerations to take into account before you even begin your search. Traditionally, neck knives are meant to hang around the neck (hence, the name) to provide quick access, but can also be worn over the shoulder and beneath the arm. The blade is fixed, and can varies in length from one to six inches. State Laws: All states have different laws and regulations about how you can legally carry a blade, and what specs the blade must fall under. Check with your local carry laws and be aware of the consequences of carrying outside those limits. Usage: Neck knives are great for fishing/hunting, survival gear, self-defense and daily yard and house work. Depending on your primary use, you will find some blades work better than others. Keep this in mind when selecting a knife, as well as what kind of chain and/or sheath you pair with it. Cost: The price points for neck knives vary from several dollars to several hundred dollars. While low-cost options are always available, mind the reviews and do your research on the blade quality. Handling a low quality blade is an easy way to get yourself hurt. Material: Some common blade materials include stainless steel, carbon steel, alloy steel, titanium alloy, and ceramic. Carbon steel is one of the toughest and most durable, but can oxidize if you’re using it for cutting foods or plant material that is acidic. Stainless steel will not corrode as easily, but is not as durable or strong. Titanium alloy is strong like carbon steel, but more lightweight, making it an excellent choice for any use. Ceramic blades are corrosion resistant and hold a sharp edge. They are also very strong, although they do not flex with pressure like metallic blades can. Blade Type: There are innumerable different shapes for blades, and each style has it’s own purpose. Some of the more popular styles include: Clip point (sharp point, good for piercing); Drop point (strong tip, large cutting edge); Tanto (strong point and good for piercing, limited cutting edge); Sheepsfoot (clean cuts, no piercing point-good for avoiding accidents); Spear point (intended for piercing soft targets, strong sharp point and no cutting edge); Trailing point (good for slicing/skinning, point is out of the way but weak); Gut hook (good for skinning/slicing/dressing game, large cutting edge). Size: For self-defense use, the experts recommend between 4 and 6 inches of blade, with a sturdy handle. Tanto and spearpoint blades are good for this purpose. For survival kits, a moderate blade of about 5 to 7 inches will be ideal, and the drop point is the best all-purpose blade you can choose, and can be found with a partially serrated edge and skeletal handle to give the option for creating a survival knife kit. For hunting, the gut hook comes with blades averaging from 3 to 5 inches. Now that you’ve got a good idea of what you’re looking for in your neck knife, below you’ll find some of the highest consumer rated fixed blade neck knives available for purchase on Amazon. All are affordable at around $50 or less, and are made of high quality materials and carrying the most trusted names in blade manufacturing. 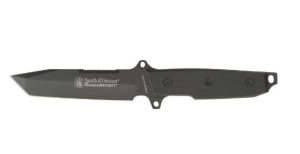 First up, a great knife for personal protection-the S&W Homeland Security Top Serrated Tanto Knife. With a 6 inch, top serrated, titanium coated blade, this knife gives you durability and comfortable grip, along with a heavy-duty nylon sheath and a lanyard hole. Next, you’ll find a 6.5 inch titanium coated survival knife by Schrade. This knife has a comfortable hand feel and finger guard, and comes with a click-lock sheath and a built-in utility tool. The back edge is serrated, and the utility tool is multifunctional, including a flat-head screwdriver, can opener, nut wrench, and a gut-hook (more uses can be found with a little creativity). This last suggestion is for the hunters out there, and is a classic Gerber gut hook with a 4 inch titanium coated blade, nylon sheath and nonslip rubber grip. Gerber is known for long-lasting sharp edges and durable blades. As you can imagine, there are thousands of excellent neck knife choices on the market, and the best way to determine what has the best feel and weight for your needs, you must go out and handle different knives before purchasing. A local hunting store or knife shop will have the greatest variety, and you may find your favorite online for the best price after shopping the stores for the best fit. Remember to keep local laws, intended usage and price points in mind when out shopping. If a tight-fitting sheath is available, don’t forget to pick one up to avoid accidental injury while carrying, and also check the warranty on the knife in case corrosion, rust or damage to the blade occurs with normal or light usage. If you are using the knife for underwater activity, make sure you look specifically for dive knives, as they typically have a proprietary titanium finish that can withstand water exposure. Also keep in mind that the manner in which you plan to wear the knife around your neck will differ depending on usage. A beaded chain would be best for self-defense and break away for safety.